33A Hope Road, Kingston 10, Jamaica, W.I. 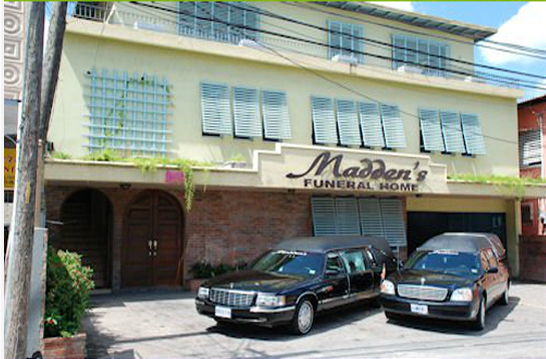 Madden’s is able to cover total funeral needs – i.e. Cremation and Cemetery facilities both in Montego Bay and Kingston. We recognize that you have many choices today, and we at Madden’s Funeral Home work hard to better ourselves so that we may better serve you. Please contact us here at the funeral home to learn more about us. We are available at any time to answer questions you may have and can be contacted by phone (954) 324-9550 (US) / (876) 755-3331 or by email to info@maddensfuneralhome.com at any time.